It was a long road that led 'Undercover Boss' Don Fertman from singing as an orange Crayon in a pop band, to serving as the chief development officer of Subway, the 14 billion dollar sandwich empire with 33,000 stores in 93 countries. That road included a pit stop in rehab for drug and alcohol abuse, which is not uncommon for professional rock musicians. Oddly enough, however, until he went undercover, he'd never made a Subway sandwich -- ever. Oh, he paid for his inexperience all right, thanks to a very serious and exacting sandwich artist by the name of Jessi, who is being touted as the toughest employee of all. "Our fastest sandwich artists can make a sandwich, wrap it up and put it in the bag in 40-50 seconds," Fertman explains. "It took me a little longer. As a matter of fact, Jessi told me 'There's no such thing as a five-minute sandwich -- until now." She eventually yanked Fertman, who was going by the name of John Wilson, off the sandwich line, and put him in his place, in back, washing dishes and emptying trash. She was completely overwhelmed when Fertman revealed himself as Subway's Chief Development Officer, and offered to pay for her college education, which, she'd confessed earlier, she was having troubles covering. He also promised to pay for a vacation for Jessi and her father, who had been parenting her single-handedly since her mother left. Twenty-nine years ago, when Fertman started with the company, he never believed he would go so far and fall so low. He first came in contact with the company performing the theme song 'It's a great day for a Subway,' in a rock band called The Crayons. "I was the orange Crayon," he says. "I dressed in orange, drove an orange VW and lived in Orange, Conn. Our band would tour the stores, and everyone would request our biggest hit, which was the Subway song." When the band broke up, Fertman was offered a job selling Subway franchises. He's since worked his way up. His cover for the Undercover Boss gig was that he was competing on a reality show for a job, and another "contestant" was also followed around by a camera crew, so workers wouldn't be suspicious of Fertman. He says he loved almost every minute of it. He didn't love holding up the line at an Auburn, Ala., store on game day. His supervisor, Sherri, who had been with Subway for 19 years, felt that Fertman was being a little bit too gregarious, and that his conversations with the customers were slowing him down. She had the perfect balance, and was later recognized for it by being offered $10,000 to star in a Subway customer service video and be flown out to the national conference in California, where she would also get a little R, R, and R --Rest, Relaxation and Retail. Next, Fertman didn't exactly rise to his baking duties. 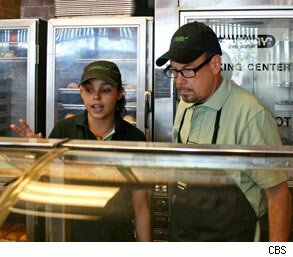 Subways bake their own bread and cookies in special ovens, and, at a new store in Orlando's Science Center, Fertman proved he couldn't do either one well, let alone master both at the same time. His supervisor Efrain made it clear that he thought his grandmother could work faster. Fertman became so confused he locked himself in the walk-in freezer, and Efrain had to find him and let him out, but he was rewarded for his efforts. At the end, Fertman gave Efrain $5,000 to donate to the foster program of his choice. It seems Efrain had been a foster child who was later adopted, and wanted to do the same thing for someone else. Efrain also got $1,000 to do something nice for his adoptive mother. It was in church where Fertman had what was probably his most satisfying experience. There's actually a Subway shop in Buffalo, N.Y. that's based in a church building -- it's been there for five years. "Reverend Darius showed how Subway can be used for community outreach," Fertman says. "They provide job opportunities, interview experience, etc." as well as good, healthy food. The manager, Duane, who showed Fertman how to make deliveries, confided that he was actually the pastor of a church in Niagara Falls. Later, Fertman waived the $15,000 franchise fee so Duane could start a Subway store in his own church. Fertman also gave him $20,000 for a scholarship fund for his four adopted children, and made him and Father Darius the stars of a community outreach video so other Subway franchisees could learn how to do more in their own communities. 1. What was your first job? Pumping diesel fuel at a truck stop. 2. What inspires you? My wife inspires me to be a better person, my children inspire me to be more kid-like and music inspires tears and laughter. 3. What is the most important trait needed to succeed? Determination. 4. What is your biggest challenge? Making Subway a household word in every country where we're located. 5. What is the best career advice you ever received? Don't quit your day job. My father asked me, "When are you going to get a real job?" It was fun playing rock 'n roll, but coming to Subway was the best thing that ever happened to me. Fertman has two young children who grew up with Subway, and still want to eat there every chance they get. Although he can make his own Subway sandwiches in the company lunchroom every day, after 29 years, Fertman still often indulges the kids. They have a mutual love for the Spicy Italian and the Jessi (a new concoction inspired by the 'Undercover Boss' episode). But his absolute favorite is a sandwich unique to Japan, which involves pastrami, potato salad and melted cheese. Potato salad? On a bun? When you have stores in 92 different countries, it takes all kinds. Fertman says his 'Undercover Boss' experience helped him discover and appreciate many more of them.